When light goes from one type of material to another, it can change direction at the surface. This is called refraction. The "strength" by which a material can bend light is called the index of refraction. If the light goes into a material with a greater index of refraction from what it had been in, it will be bent in the direction perpendicular to the surface (called the normal direction to the surface). If the light goes from a high index of refraction to a low index of refraction, it will be bent away from the normal. The greater the angle with respect to the normal, the more the light is bent - light entering a surface perpendicular to that surface doesn't get bent at all. You can use this to focus or defocus light. Take a transparent substance and shape it so it has a curved surface. Now light shining on the substance is bent by different amounts depending on where it hits. This is a lens. Just as with windows, you need to use a material for your lens that is transparent to the light that will be going through it. 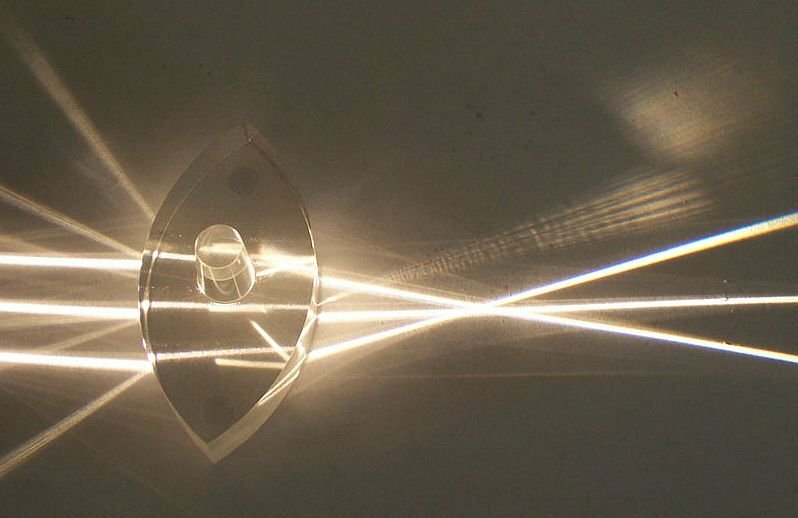 Here is an example of a converging lens in two dimensions. And here is a diverging lens in two dimensions.